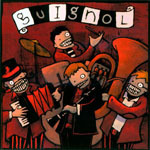 Guignol is a tuba/accordion/clarinet/drums quartet, the raucous, symptoms theatrical, spastic and melodramatic soundtrack for singing grifters, murderous marionettes, and grease-painted gutterballs. It’s an oom-pah wedding, squealing and lyrical, that hits like punk rockers and sings like a gypsy camp. Led by Peter Hess (Balkan Beat Box, Slavic Soul Party, World/Inferno) and Franz Nicolay, this is their self-titled debut.